Greetings, Judges! 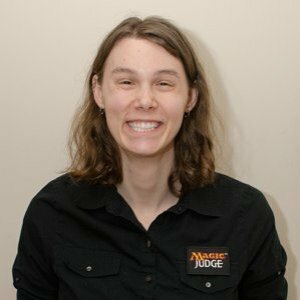 This week’s Judge of the Week is not just excellent with her rules knowledge and customer service (as her recent recognition through the Exemplar Program shows), she’s also an avid collector of original Magic art and helped program MTG Familiar. Additionally, she has created and updated an electronic decklist. Time to get to know April King ! 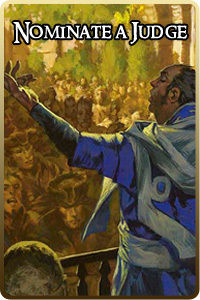 Favorite card: Opt: A perfectly balanced card, with great art and flavor. I’d love to see it in Modern! Least favorite card: Sneak Attack: I have lost so many games where my opponent managed to resolve Sneak Attack with an empty hand, only to top deck Emrakul three turns later and win. Commander General: Jenara, Animar, Shirei, Shattergang Brothers, Damia. Best tournament result: I don’t usually play in big tournaments, but I win ~$1-2k/year playing Legacy. Random fact about yourself: I was once the #1 rated player in the world in the CCG Culdcept Saga. I was at my first ever competitive event, a Sealed PTQ during Dark Ascension. Round two, Josh Marin came up to me and told me that I had an invalid decklist — I had forgotten to list a card — and that I would be getting a game loss. I was pretty devastated, and went on tilt the rest of the day, going 4-4. Josh had seen how upset I was about the game loss, and gave me some of his trademark gummy bears after the round. Over the course of the day, I ended up talking to him about judging and it ended with being invited to his weekly judge EDH group (Rob McKenzie , Steve Peterman , Julian Marin , etc.) If not for his kindness, I likely would never have become a judge. I started playing back in 1994, when a bunch of neighborhood kids showed me the decks that they had built. I was hooked, and immediately built an “unbeatable” Circle of Protection deck, with four of each color. Work on your soft skills! Just as bad bedside manner leads to malpractice lawsuits for doctors, so it does with judging and appeals. Doctor or judge, we all make mistakes. It’s how people perceive their treatment that determines the outcome of the interactions. Using orienting comments, engaging in active listening, soliciting opinions, and laughing or smiling- these skills are easily as important as having an extensive rules knowledge. My local area has an absolutely immense Legacy community. There are 4(!) weekly FNM-style tournaments at different stores that all regularly pull in over 20 players. My home LGS, Mead Hall Games & Comics, hosts a $100 Wednesday Night tournament that frequently has over 30 players. It is a matter of much consternation to myself that the Midwest continues to get passed over for Legacy GPs. I cast Laquatus’s Champion while cubing; for almost the entirety of its existence, the card simply didn’t work at all. CR607.1 is worded the way it is because I bent Matt Tabak to my will and got him to change it with the RTR comp rules update bulletin. Take that, Matt Tabak! Bwahahaha! Being able to comfortably talk to complete strangers is a surprisingly difficult skill to pick up in everyday life. When you’re constantly tossed into the deep end with judging, you have to learn to at least fake it well. Back when I was an L1, I was blown out in a Legacy match where my opponent milled away my entire library with Painter’s Servant + Grindstone. I had been certain that that Humility would save me, but it let me down horribly. Erayo is a fun card! For a couple years, I ran a program at the local library, teaching Magic to children. At one point, I had over a dozen kids showing up every week. Eventually, the strain between judging, the program, and raising my kid became too much and I had to stop, but it really was an incredible experience. Watching those kids excitedly paw through the giant boxes of cards to build new decks that they couldn’t otherwise (for various reasons) was truly wonderful. Probably Jaya Ballard. She spent her childhood in poverty, and eventually grew up to be a willful, powerful, badass woman. I’d love to set such an example myself. Plus, her hilarious flavor text is what turned me into a Vorthos and made me a lifelong Magic fan. Things have changed a lot in gaming since then, but back in 1995, there were very few female role models in either fantasy or gaming. You have designed a way to prepare a decklist online. Why did you work on that? What sort of effort did it take to put it together? What sorts of triumphs and snags did you run into while doing it? How many people are using it? What are your plans for it? I actually have a long history of hating the decklist. Back when I was actively developing MTG Familiar, I pushed for and created a deck counting tool, a feature that is now common in a lot of Magic apps. This certainly helped the round one counting, but still didn’t fix the other problem: the extensive time spent doing beginning and mid-round deck checks. Much time is spent trying to decipher poor handwriting, weird capitalization, and randomly ordered lists, which leads to longer time extensions. This leads to longer rounds, which leads to me having to spend more time on the floor and less time at home with my family. One day in mid-2014, I went to a Legacy tournament run by a fellow L2, Mike Combs . As I showed up early to hang out, he offered to let me fill my decklist out electronically, using the PDF that Wizards provides. As soon as I started using it, it all clicked into place: this is why players don’t fill out decklists electronically! The tab order was completely nonsensical, you were constantly craning your neck to read sideways. It was just a really miserable experience. I sat down that evening and started coding decklist.org, designed to allow a player to create a perfectly formatted and counted decklist, in just minutes. I’ve been working on it for about six months now, and I’m really happy with where it is currently. Major TOs around the country are using it for their GPs, as it can include custom logos and be prepopulated automatically. It’s been used for over 15,000 decklists thus far, and I’m really hoping for a day when the majority of decklists are filled out this way. I still have a lot of work to do though. Adding functionality for format legality checks, verifying DCI numbers, automatic uploading, and all sorts of other goodies are planned. Let’s talk about original art. How did you get started collecting it? How many pieces do you have? Do you have a rough appraised value of your collection (if you’re willing to share)? How do you get most of your pieces — direct from the artists, from auctions, or another avenue? Any interesting stories from seeking or getting pieces of original art? 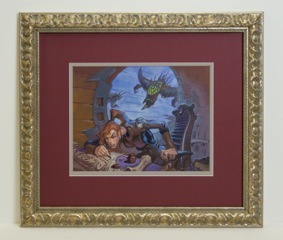 What is the pride of your original art collection, and why? What are some of the other favorites you have? Where do you display it? Is there a dream piece you’d love to acquire, and if so, what is it? Luckily, I have the gallery up on imgur, for those who would like to see. I purchased most of these pieces before the Magic art world started going crazy, with new pieces regularly fetching many thousands of dollars. I have no idea what their current value is, aside from “a lot”. All but one of them was purchased directly from the artist, but that has become increasingly more difficult as people clean out artist’s entire back collections. My own personal pride of my collection is Opt: Hanna was a immensely important character in the Magic story arc, and Opt is certainly my favorite depiction of her — no offense, Terese! As far as other people are concerned, Totally Lost is the crown jewel of my collection. Ever since his first appearance in Gatecrash, he has been a huge fan favorite. Plus, it’s a riot to watch my two-year-old try to pronounce “Fblthp”. I have one piece that I have been pining for above all others: Pristine Angel, by Scott Fischer. It’s unlikely its owner will sell it anytime soon, but I keep holding out hope. In the meantime, I’ve been considering getting it tattooed on my thigh. At GP Omaha, you hosted a panel of artists. How did that come about? What were some of the highlights for you of doing that? I’ve long been friends with Rob McKenzie (a fellow Vorthos) and Steve Port. Together, they run Legion Events, the organizer for GP Omaha. Rob’s passion for art lead to a huge collection of artists, and it was his idea to run a panel for the attendees. I was terrified about the prospect of running a panel for the first time, but the artists had such great camaraderie that it ended up being easy and incredibly fun. If you’re interested in how it went, you can read the transcript over on Gathering Magic. What’s your take on the progress Magic as a whole has been making toward its goal of creating welcoming, diverse environments? This is certainly dangerous territory to wade into! I’d first like to say that, by and large, the Magic community — both players and judges — have been incredibly welcoming and friendly. And Wizards of the Coast, while stumbling occasionally, has by-and-large done a magnificent job of portraying women inside their worlds. Still, I won’t sugarcoat things by saying that I haven’t experienced deprecating comments and sexual harassment, both from players and from within the judge community. It’s certainly disappointing, if not altogether unsurprising. I will say that a large part of why I wanted to become a L2 judge was so that female players would feel more comfortable at events. It’s my personal opinion that the best way to attract more women to Magic is by simply having more women that play Magic. First impressions count, and when you go into your LGS for your first FNM, having other women there makes a huge difference in feeling if you belong. I am happy that it does seem to be getting better. There has been a marked difference in the number of women that appear at Opens and GP-sized events over the last few years. Still, I think we’ve got a long ways to go before it’s normal to have multiple women playing at everyday Magic events. Tell us about the your cube. It’s a standard 720 card cube, featuring a lot of broken cards (JtMS, Tinker, Channel), but it’s unpowered. The most unique thing about it is how it shores up black by offering multiple Gravecrawlers, Bloodghasts, and Carrion Feeders, as well as ways to exploit them. It’s about 50 cards short of being fully foiled and is so valuable that I end up having to pay several hundred dollars a year just to keep it insured. Talk about your connection to roller derby. I was a rollergirl for seven seasons on the Minnesota Rollergirls. I’ve broken about a half-dozen bones, partially torn my rotator cuff, had bruises that covered nearly my entire thigh, and had abrasions that bled for days. It was probably the most fun thing I’d ever done, and if not for multiple severe concussions, I’d probably still be doing roller derby instead of playing Magic. 1. April was once featured on ESPN SportsCenter, smashing a woman to the ground during a roller derby bout. 2. April once wandered aimlessly about Japan for a couple months, despite not speaking a lick of Japan. 3. In her spare time, April has raced her car in multiple events, driven a Formula 1 vehicle, and jumped out of airplanes. Sergio did not win the under-12 Spanish Chess Championship when he was 10 years old although he has won a few cups as an adult! Thanks April, for the work you do on and off the event floor! As usual Judges, don’t forget to keep sharing awesome Judge stories around the world. Nominate a Judge TODAY! Victor, the answer will be posted in next week’s interview! Check it out then! MTG Familiar and decklist.org are awesome tools!